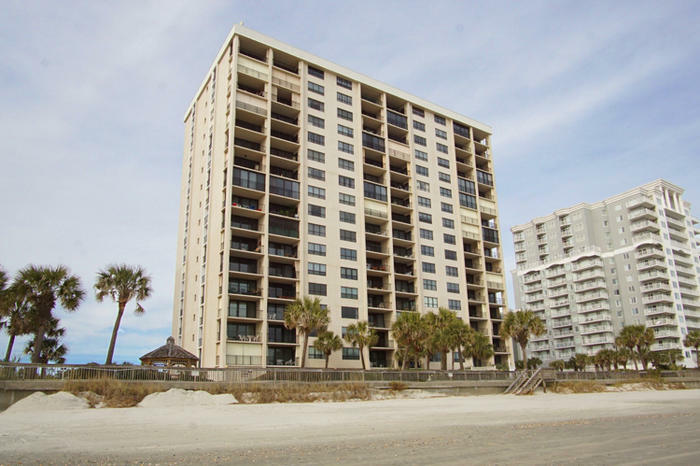 If you like to have all the comforts of home on your North Myrtle Beach, South Carolina vacation, then Arcadian One rentals will certainly fit the bill. Our comfortable two-, three- and four-bedroom condominiums include fully-equipped kitchens, free Internet access and private balconies that overlook the beach and the spectacular Atlantic Ocean. When you stay at Arcadian One you will also enjoy on-site laundry facilities, covered parking, a private seven-acre fishing pond, a picnic area, elevator and game room! Arcadian One truly offers enough in comforts and amenities to make everyone in your group happy on your North Myrtle Beach getaway! Many people travel to the North Myrtle Beach area because of its Atlantic Ocean location and all of the water sports and outdoor activities that are available to enjoy. You and your guests need never leave the premises of Arcadian One to get your fill of time in the sun. Our shimmering swimming pool is close enough to the beach to hear the waves crashing on the shore—how relaxing to settle in a comfy lounge chair with your favorite book as the kids splash around in the pool—be careful, you might just fall asleep! If you are more of a beach person, just a few steps take you to the sandy shore—why not take this opportunity to do some parasailing, surfing or learn to snorkel? Maybe all you want to do is relax—then park yourself in a beach chair down by the water and let the surf roll in over your feet—heaven! When you reserve an Arcadian One vacation rental you will also have access to a private seven-acre fishing pond and we are also just down the beach from a popular fishing pier. When you are ready to head back out into the real world all the excitement of North Myrtle Beach will be waiting for you! Known for its huge selection of gorgeous golf courses, it will be easy in this area of South Carolina to find a course to suit your abilities and budgets. Do not worry if you forget some of your golfing equipment, there are plenty of golf stores near Arcadian One that will be happy to help outfit you! If you are traveling with a couple of future golfers why not take them to one of the many putt-putt courses that line the streets of North Myrtle Beach and let them get their feet wet? Speaking of getting wet, you will certainly want to check out Myrtle Waves Water Park—it offers wet and wild thrills for the whole family! A North Myrtle Beach vacation would not be complete without trying more than one of the fabulous restaurants in the area. North Myrtle Beach is known for its seafood buffets, but there are also wonderful breakfast spots, fine oceanfront restaurants, ocean dinner cruises and more. Nightlife abounds in North Myrtle Beach, and staying at Arcadian One puts you close to your choice of shag dancing nightclubs, live concerts, street musicians, movies and theatre. Do not forget about the shopping—two outlet malls, souvenir shops, antique stores, malls, trendy boutiques and one-of-a-kind stores are just around the corner from Arcadian One! North Myrtle Beach is a popular vacation spot for families and offers plenty to entertain both kids and adults alike. Check out the attractions and Ripley’s Aquarium at Broadway at the Beach. Spend an evening at the Pirate Voyage Dinner Theatre. Take a jungle cruise or ride go-karts, visit Family Kingdom Amusement Park or ride the Myrtle Beach SkyWheel. Whatever the age or interest of your group, North Myrtle Beach has something that will excite you!